I received this today in the Swap-bot 100,000 swap, the swap celebrating Swap-bot's 100,000th swap. (Wow, that was repetitive.) 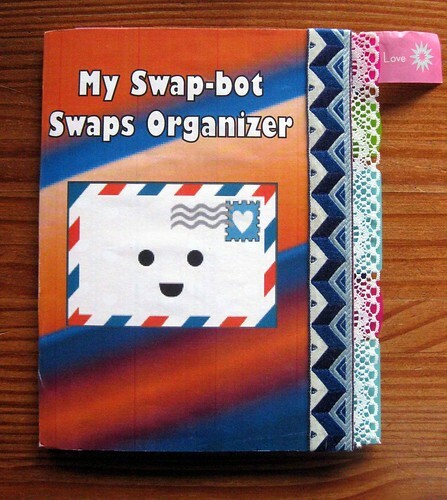 It calls itself "My Swap-bot Swaps Organizer." 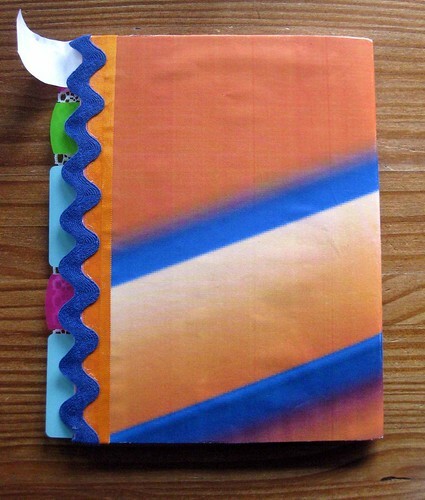 It is handmade, clearly with love and effort, and it is something that I will never, ever use for anything. (In all honesty, I would have preferred a groovy postcard, but there's the Swap-bot smorgasbord serendipity for you.) But it's hard to throw in the trash, since someone put so much effort into making it, and maybe someone would use it... does anyone else want it? I imagine someone does. So, I'm offering an immediate giveaway for anyone in the USA. 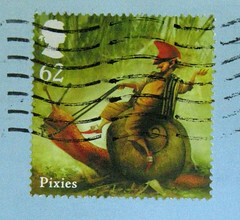 Sorry, USA only because I can send this very inexpensively via media mail, but it gets much pricier beyond American borders. 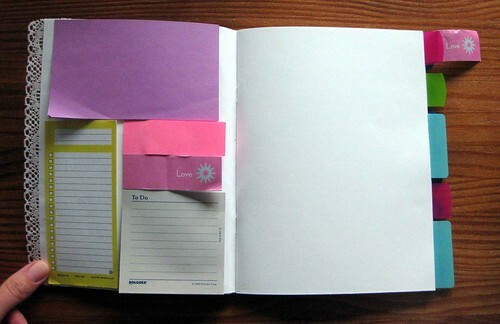 Inside the front cover there are some post-it notes of different sizes. 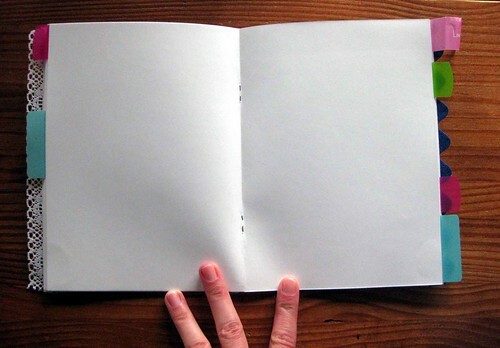 All pages inside are blank, and there are a few plastic tab dividers. Want to take it off my hands? Read the rules below and comment on this post. 2. WHO: No anonymous comments will be approved. You need a blogger profile to enter this giveaway (simply because I need to know who you are - I'm not going to count through "anonymous #7"), and if you don't have a blogger profile yet, just make one. It's fast, easy and free, doesn't require a blog, and I think only requires a valid email address. Also, your profile with email address MUST be viewable, or you must provide a valid email address in your comment. If you don't have an email address in your comment or viewable from your Blogger profile, and I don't magically randomly already have it, I won't approve your comment/entry. Lastly, keep your eyes peeled for this magical phrase after you submit your comment/entry: "Comments will be visible after blog owner approval." If you miss that and comment twice, or three times, or more, I'll delete duplicates. 3. WHERE: USA only. I will be sending this Media Mail. 4. WHEN: The deadline for comments/entries is Saturday, October 29 at 12pm EST. I will announce the winner Saturday afternoon or evening. I'm kendall! kconcini@umd.edu. That is adorable. Saw this posted through Twitter count me in if that's ok! ..and the winner is, Hannah! Congrats, Hannah. I'll be emailing you momentarily.